How many times have you wished you could do a few more charitable good deeds but your day-to-day routine just doesn’t afford you the time? Well, ParkCloud is giving you the opportunity to be charitable whilst organising your travel plans by getting involved with International Make a Difference Day. Celebrated since 1992, Make a Difference Day was founded when USA Weekend – the second largest U.S newspaper at that time – suggested to its readers that since 1992 was a leap year, people should take the extra day and use it to do something good for those in need. The idea caught on like wildfire and has been celebrated across the globe ever since. Falling annually on the fourth Saturday of October, this year’s celebrations take place on 27th and here at ParkCloud we have big plans! 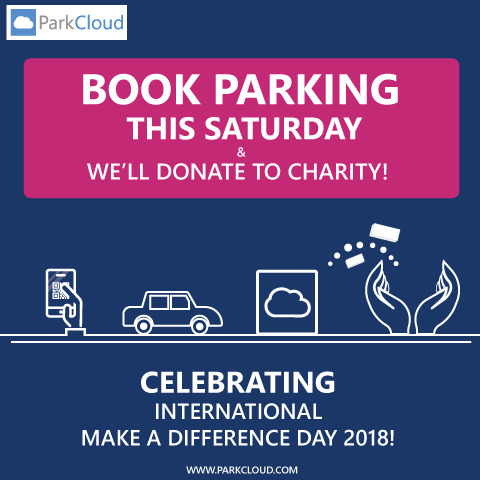 This Saturday, ParkCloud will be donating a percentage of its total bookings from that day to five very deserving international charities that work tirelessly to improve issues that affect the environment, wildlife, our children and our health. So if you have a holiday booked or need to get your city centre parking organised for the upcoming festive shopping season, why not pre-book this Saturday and help us to make a difference to some of the world’s most deserving charities.